"Yngve, Peter and I had been tossing this idea around for several months and went to work on the project just after Yngve returned from Argentina. Our magazine concept is very simple and along with our Art Director, Peter Huber, we have decided to release a new issue every time we return from a trip. We will release issues from previous trips, but for the most part we will focus our efforts on recent travels. The first issue of Scanout Magazine focuses on a trip that Yngve Ask made while traveling throughout Patagonia. It is titled Mustangs of Stag River and Yngve takes us on a photographic tour of this amazing Estancia and the Mustangs that roam its seemingly endless territory. The second issue of Scanout Magazine takes place in Miami Beach, as we pursue The Silver King with Captain Carl Ball. 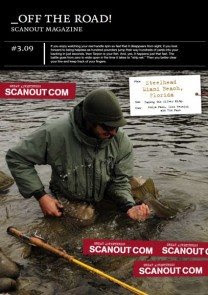 This latest issue (shown below) of Scanout Magazine focuses on a Steelhead float trip. We hope you enjoy our newest project." We're sorry, your browser doesn't support &amp;amp;amp;amp;lt;span class="blsp-spelling-error" id="SPELLING_ERROR_11"&amp;amp;amp;amp;gt;IFrames&amp;amp;amp;amp;lt;/span&amp;amp;amp;amp;gt;. You can still &amp;amp;amp;amp;amp;amp;amp;amp;amp;amp;amp;amp;amp;amp;&amp;amp;amp;amp;lt;span class="blsp-spelling-error" id="SPELLING_ERROR_12"&amp;amp;amp;amp;gt;lt&amp;amp;amp;amp;lt;/span&amp;amp;amp;amp;gt;;a &amp;amp;amp;amp;lt;span class="blsp-spelling-error" id="SPELLING_ERROR_13"&amp;amp;amp;amp;gt;href&amp;amp;amp;amp;lt;/span&amp;amp;amp;amp;gt;="http://www.yudu.com/item/details/46614/Scanout-Magazine---Steelhead-Paradise--BC---Issue---35-3.09?refid=14151"&amp;amp;amp;amp;amp;amp;amp;amp;amp;amp;amp;amp;amp;amp;gt;visit this item.&amp;amp;amp;amp;amp;amp;amp;amp;amp;amp;amp;amp;amp;amp;&amp;amp;amp;amp;lt;span class="blsp-spelling-error" id="SPELLING_ERROR_14"&amp;amp;amp;amp;gt;lt&amp;amp;amp;amp;lt;/span&amp;amp;amp;amp;gt;;/a&amp;amp;amp;amp;amp;amp;amp;amp;amp;amp;amp;amp;amp;amp;gt;, however. e-Zines are popping up all over the place. In the Netherlands two new ones are to be launched shortly. I checked out the online Scanout issues and I'm impressed. Very cool reading, great images, lots of adventure.